TVCNet is a Web Hosting company based in the heart of Silicon Valley, California, US. TVCNet was founded back in 1997 by Jim Walker and a group of experienced hosting engineers. Their mission was, and still is, to provide a hosting company with the customer in mind. 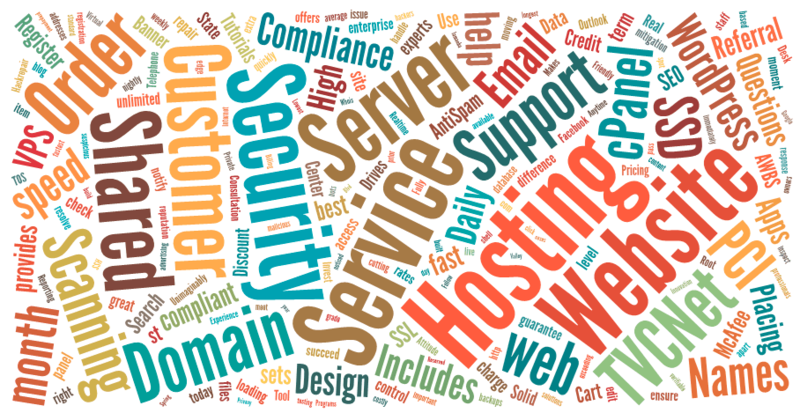 Providing high-quality customer service and web hosting that has an emphasis on security is the heart of TVCNet. Jim and his colleagues created TVCNet almost two decades ago, and now they in the unique position of owning all of the hardware they use to provide hosting. Their customer-centric approach is evident in the way they provide both customized services and support. They say that they are “committed to exceptional customer service”. At TVCNet they pride themselves on their proactive security, reactive security specialists, and their responsive service. Their proactive security is literally at the heart of the company and begins in the control room of their Californian server center where everything is monitored. The control room is manned 24/7 by a monitoring team at the network operation center. The monitoring team is made up of network specialists and system engineers. They boast having one of the most modern network administration centers’ in the World. The fact that these security specialists are on hand 24/7 leads nicely in their reactive security specialist pledge. Their advanced monitoring allows them to quickly see to any issues the second they arise. Save time and money by taking out TVCNet’s Spam Protect Service, whereby 99% of junk mail will be stopped in its tracks, thus freeing up bandwidth and saving time. Furthermore, the spam is placed in quarantine, should you wish to review the emails. Spam Protect also provides daily quarantine reports and offers a valuable service, where it blocks computer virus’. This service is quite invaluable and could save hours, if not days of your time. TVCNet offers a fantastic service where you get the first month totally free! TVCNet provides a full WordPress Monitoring, Security and Updates Management Service which will free up your time and make sure that your website is always kept up to date. They monitor your WordPress version and plugins to make sure that everything is up to the minute. With this service, they will also monitor your website and let you know of any changes that are made. You will also receive heavily discounted hack repair service, should you need it. At TVCNet they believe that security should not be outsourced or something separate from your hosting. They have created and trademarked WebTight™ Security, where they are available within minutes to help with any security issues that may arise. Their multi-level Security Systems include Regular Backups, Daily Malware Scanning, Anti-Spam / Antivirus Email Services, Strong Firewalls and Server Security, Content Management System (like WordPress, Joomla, Zencart and others) Security and Expertise. California is known for its power outages, which could negatively affect the server uptime. TVCNet has this covered and provides a non-stop service. This is all achieved due to the fact they have installed a diesel generator that kicks in when there is an emergency. In this situation, the batteries of the UPS are charged by massive 2 megawatt Caterpillar diesel generators, which are fuelled from a 3000-gallon tank. The whole company was created to serve the customers’ needs first. That is why they tailor the hosting service (should that be required). Every imaginable hosting service and addon has been carefully thought out, from design consultations to VPS. TVCNet doesn’t just provide hosting services, they also offer a “Hacked Website Cleaning Service” whereby they can assess, reinstate and secure your website if it gets hacked. They work directly with Google and ensure that your website is unblocked with Google, or you get a full refund. Can’t say fairer than that! The focus with TVCNet is not on offering a cheap service; they want to provide the highest quality of service and care for their customers. However, their pricing is very reasonable. Security is the main focus for TVCNet, they go the extra mile for their customers, to provide heightened security. This is their USP, not cheap hosting, but quality, secure hosting services. All of the Shared Hosting plans on TVCNet come with the following free services: One Click WordPress Install, Free Website Migrations, SSH Command Line Access, High-Speed SSD Hosting, Free Nightly & Weekly Backups, Firewall & Malware Scanning, cPanel Control Panel, CloudFlare CDN Included, LiteSpeed Included, WordPress Expert Support, Unlimited Email Accounts, Anytime Money-back Guarantee, PHP 7+ Included and Free SSL. Below is an overview of their 5 levels of Shared Hosting services. All of the dedicated servers on TVCNet are fully managed. Therefore there are no extra fees for support (as this is included with all of their dedicated servers). They are also offering a special, where you can order 6 server packages and get one free. The company has been up and running for nearly 2 decades, so you can be sure that they know what they are doing. With one of their core philosophies being that of innovation, you will be getting a great up to the minute range of products and services if you choose to host with TVCNet. Security plays an integral part in every step of TVCNet’s offerings, therefore you know that you will be getting the best possible security at every level. Even before TVCNet formed, the founder and some of his team were already in the web hosting space. So these guys know their stuff! This is a bit of a downfall, mainly because it would be amazing if these types of hosting companies were to spread worldwide. Their passion for offering a high-quality service shines through and it would be wonderful to have more locations added to the map. Although TVCNet offers a great range of services, they don’t seem to offer free domains with any of their lower priced products. This may pose a barrier to entry for people on lower incomes. We think that TVCNet is a fantastic hosting company, with passionate staff that has thought about their customer every step of the way. It seems like TVCNet is dedicated to doing everything possible for their customers, especially when it comes to providing total security for your website and email hosting. Their services are never outsourced and all of their services are done in-house, by experienced engineers in their California Hosting Center.